Are you a RE Store Rockstar? Carly and Jake are! They are in the process of converting an out-building into a mother-in-law apartment on their property. When they first inherited the space, it was semi-finished and had electricity but no plumbing. A few trips to The RE Store, lots of hard work, and plenty of creativity resulted in a gorgeous renovated space fit for a reuse king or queen! 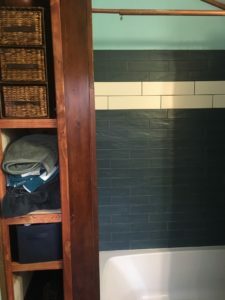 From Carly: “We had great RE Store luck finding tile over the course of a couple of weeks. We first found a small amount of gray and used that for the flooring. Next came the blue and white tile which we used in the shower. 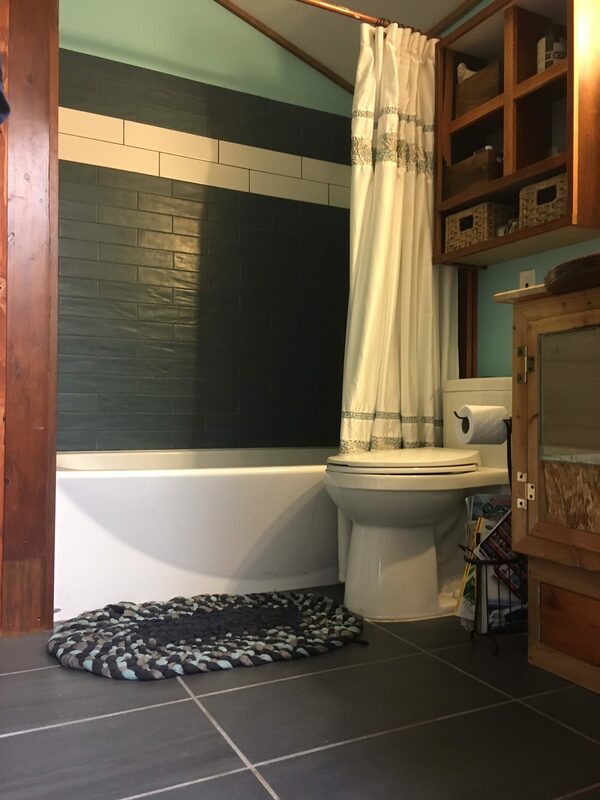 Fortunately we also found gray grout and caulking, so we ended up using that for the whole project, including the backsplash. 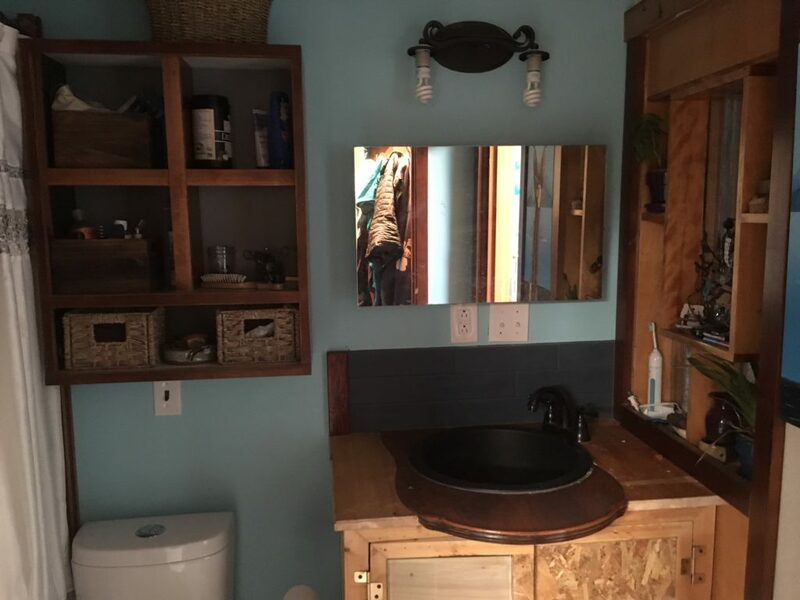 The black utility sink was a great fund and Jake built that into the vanity. I purchased the two pieces of glass months ago with no specific idea in mind, so Jake incorporated the glass as well as lots of odds and ends, scrap wood, sink, and creativity into the design for the vanity. 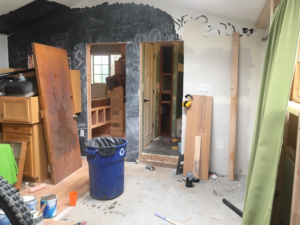 Both sets of shelving (the towel closet to the left of the shower and cabinet above the toilet) and the trip were recycled from scraps of wood and old furniture. We found a shelf, now in the wall to the right of the sink, as a random and cool RE Store object that was inexpensive. We thought we could use it somewhere, and it ended up fitting perfectly into the space. There was originally a piece of broken glass back there, so we took that out and replaced it with a sheet of metal roofing. Have you built or designed something using reclaimed and salvaged materials? Share photos and your story with us for a chance to win a $25 RE Store gift certificate.